This economy self-propel wheelchair is easy on the wallet and has plenty of features too- detachable arms with good padding, a fold-down backrest, adjustable footrests that swing away when required, and heel loops. The leg rests can be elevated. The weight is pretty good too, at around 16kg all set up and ready to go. 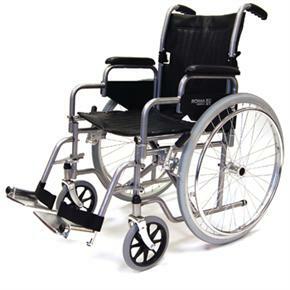 Economy doesn't have to mean low quality, and we're very confident that this wheelchair offers quality and value for money, with good construction and good design too. It's practical and durable. A product of good quality, which arrived very quickly. Easy to assemble (foot rests only to attach) and put to use straight away. My parents were very pleased. Many thanks.